This week Two Coats of Paint asked figurative painter Nathan Lewis five questions via email. 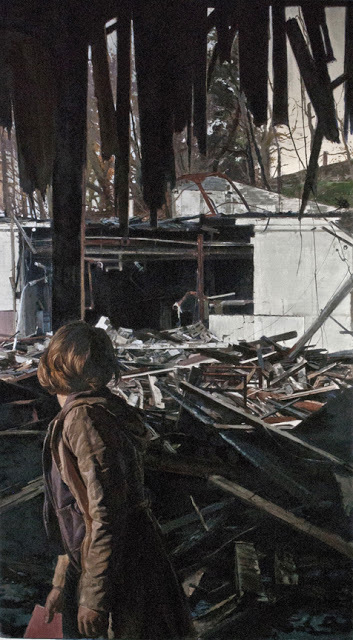 Lewis’s show, “Reading the Ruins,” is on view at A-Space near New Haven, Connecticut, through this Saturday. Here is our exchange. How would relate your work to that quote? Is it fitting? Nathan Lewis, Book Keeper, 2011, oil on canvas, 24 x 24 inches. All images courtesy of Nathan Lewis. Nathan Lewis, I Burn Today, 2011, oil on canvas, 39 x 29 inches. 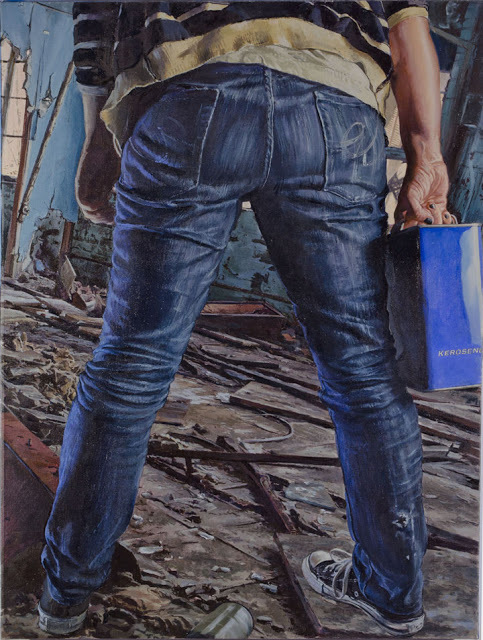 Nathan Lewis, Orpheus, 2011, oil on canvas, 62 x 32inches. That’s a great quote. I think when something is removed from its function, it is easier to ponder what it might have been and, perhaps more importantly, what it may become. 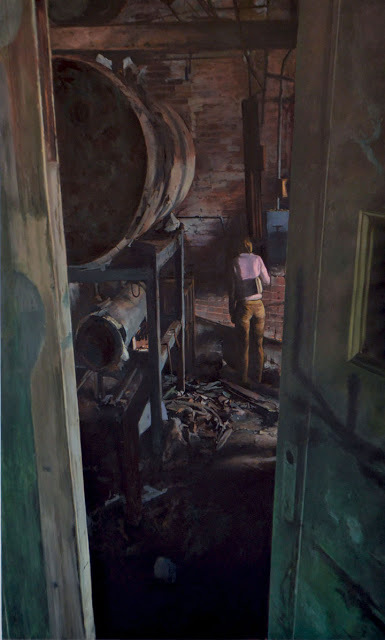 The abandoned factories viewable in my paintings no longer serve their industrial purpose. They are in-between spaces that speak to their past function but also to multiple interpretations of what they are in the present. Are they signifiers of our current economic state? Are they a shelter for society’s outcasts? Are they the cathedrals of a forgotten era? I think Diderot’s edict may suggests a few things: 1) Is a palace only understood when it is lost? 2) Is there something inherently beautiful in destruction? 3) Do humans need chaos to be complete? 2. Your work plays with light, shadow, perspective and chaos. It’s the perfect combination of ingredients for a post-apocalyptic world. As an artist that creates images like a higher being would create life, what are your thoughts on how art and the role of artists relates to possibility that one day there will be no more paint, brushes, and canvases, but instead a barren wasteland leveled by nuclear warfare or natural disasters? Nathan Lewis, Warbells, 2011, oil on canvas, 26 x 24 inches. The work could easily fit into the dystopian world of a Margaret Atwood or Cormack McCarthy novel. Although the paintings may suggest a possibility of disaster in the future, the apocalypse is also in the here and now. These are careful depictions of real factories that allow connections to past, present, and future. I think the ruins of any era speak to a fate that awaits us all. In this sense, the spaces are memento mori. Most of us will have to experience our own mortality long before the world comes to an end through human or natural forces. Maybe the work is a warning of a possible future, but I think it is also a contemplation on the mystery of mortality from the present position of life. 3. Structures, whether erect or disassembled, are also prominent in your work. A painting is a composition: foreground, middle ground, and background. In a way you are an architect planning out a way to compose a two-dimensional structure. Your building or skyscraper is not Trump Tower or the Empire State Building, but rather a complete and well rendered image/painting.What intrigues me is that when you compose an image that is meant to convey destruction, it brings up this interesting conceptual conflict: giving structure to an image displaying the collapse of structure. What is on your mind when you make these works? Nathan Lewis, Gate Keeper, 2012, oil on linen, 72 x 48 inches. I think that dichotomy interests me. My inclination in painting is to observe, map, define, fail, and understand.The mark my hand naturally makes is somewhat lacking in control. There is the inherent feeling that my hand will always create something that has a good portion of chaos in it. Trying to will the orchestration of the image has more to do with the mind and a certain aesthetic sense that is built from temperament and experience. I think the tension is always there between the lack of control in my hand and a desire of the mind to achieve a certain type of clarity. In my mind, this tension is key in holding the painting together. 4. There are figures, humans, characters lost, entangled, and surrounded by these fallen environments that you’ve created. Shadows cast to bring forth gloom, light finds ways to beam through cracks in the rubble, and diverse perspective and facial expressions tell a story of struggle. 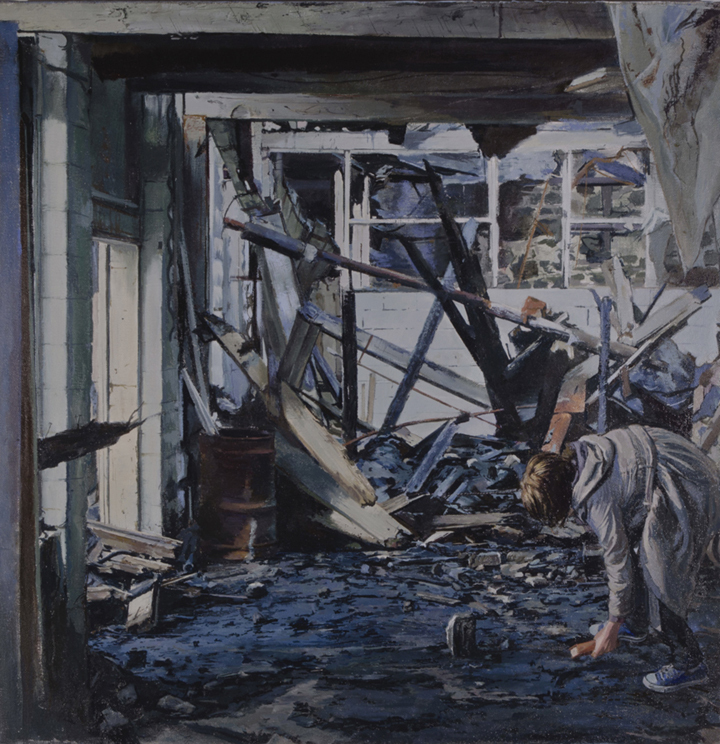 Do your destroyed environments convey the emotion of defeat alone or must they be accompanied by a figure or figures? What’s the relationship between figure and environment? Nathan Lewis, In the Dark, 2012, oil on canvas, 48 x 39 inches. I think the relationship between the figure and environment changes in each picture. Some of the pictures feel as if the environment is a product of the figure’s mental state suggested by the pose. Others feel like the space directs, contains, or controls the figure. Film has played a strong role in the composing of the images. I sift through films slowly and take stills of different scenes, looking closely at the framing, viewpoint, and lighting and how that contributes to the psychology of the image. In the past, I often would have many figures in scenes. Because of the emptiness of the factory spaces, multiple figures seem to limit the psychological impact of the environments and their meanings. I’ve concentrated mostly on single figures because it seems to fit the spaces and leave them open enough to connect with history, psychology, myth, perceptual painting, and social issues. 5. What’s next for Nathan Lewis? Where are you teaching? What are you teaching? Any upcoming shows, commissions and projects? Tell us more about what Nathan Lewis is doing and planning to do! Nathan Lewis, Light is the Lion That Comes Down to Drink, 2012, oil on canvas, 48 x 67 inches. I currently have a show up at Willamette University in Salem, Oregon titled “the Hand that Finds, the Hand that Feeds, the Hand that Fails.” It is a selection of my sketchbook drawings. I am currently an assistant professor up for tenure at Sacred Heart University in Fairfield, CT. I teach Painting, Drawing, Design, and an Art History course in Rome and Berlin. Recently I have been commissioned by the university to create a 6’x18′ mural for the new student commons building. The mural will include 20-75 figures from the university community and has a completion deadline of September, 2013. I’m also serving as a juror for a national juried exhibition called “The Figure Now,” at Fontbonne University in St. Louis, Missouri. 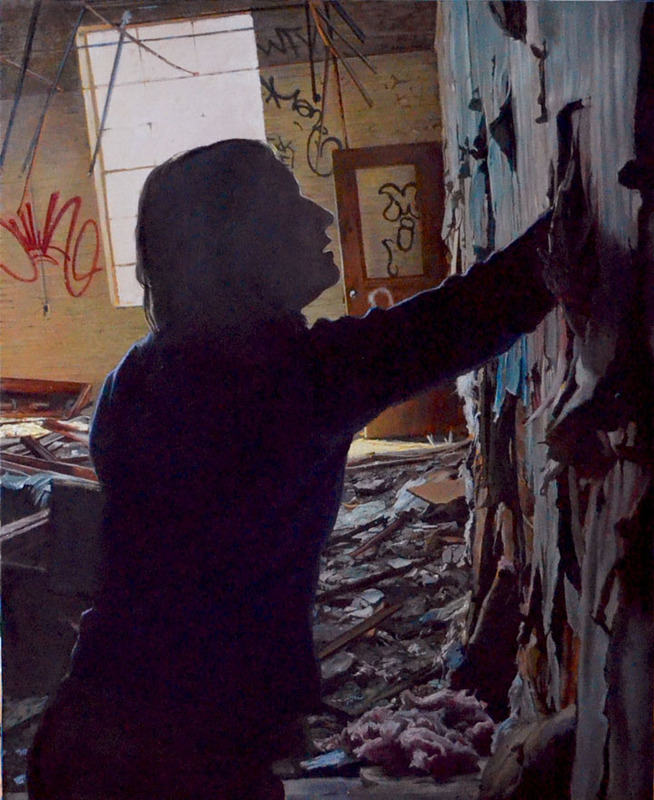 “Reading the Ruins: Paintings by Nathan Lewis,” A-Space Gallery (West Cove Studio and Gallery), New Haven, CT. Through September 29. There's something very Norman Rockwell about these paintings. Perhaps it's the painting style and the overload of "meaning" attached to them. I think ruins are more effective without people in them. Before I read comment #1, I found "Warbells" evocative of Rockwell's "From Earth to the Moon"
It is icluded in the traveling "NASA/ART" exhibit.